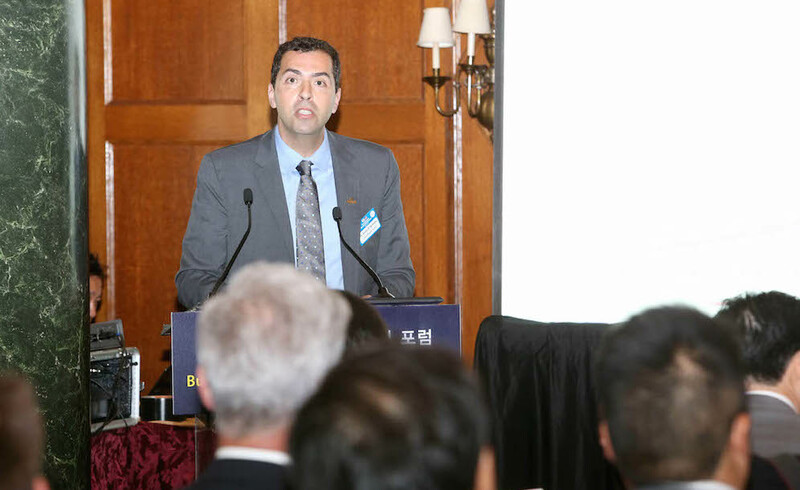 Dr. Tarabishy was the first keynote speaker at the U.S.-Korea Business Innovation Partnership conference. The venue was held at the Willard InterContinental Hotel Willard Room (Washington D.C.) on October 15th, 2016. 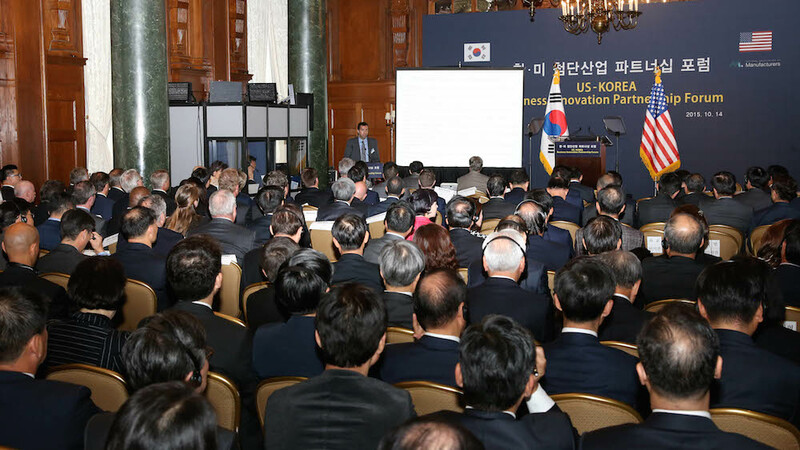 Over 200 Korean delegates and over 100 U.S. delegates composed of government officials, CEOs, policy makers, and entrepreneurs attended the event with the highlight President Park Geun-hye of the Republic of Korea. The organizers of the event were the Korea Chamber of Commerce and Industry (KCCI), the Korea Trade and Investment Promotion Agency (KOTRA), and the National Association of Manufacturers (NAM). If I were going to ask you to pick between Innovation and Entrepreneurship to make a country succeed, which would you pick? Most countries picked innovation as a national priority. As important as innovation (R&D) is, entrepreneurship should be the ultimate focus. Small and medium enterprises and those in manufacturing should lead the way in entrepreneurship. They are the ones that will enter new markets, take risks, and move fast when ideas do not work. We should embolden the manufacturing SMEs by providing them with incentives to explore, experiment, and create solutions to bridge the gap between R&D and deployment of innovation and innovated products. Ideas to explore are Lifelong training of workers at all levels, Improved access to finance, and Mechanisms that increase the role of workers and communities in creating and sharing in gains from innovative manufacturing. What advise do I give to innovate Korean Manufacturing industry? It is equally important to focus on Creativity, but you also need to Entrepreneur these inventions. Entrepreneurship is through globalization that is undertaken by small and medium manufacturing firms. Small and medium manufacturing firms need to be encouraged through private, public, and academic institutions to compete in the global marketplace. They cannot stay idle and only think local. Manufacturing in all types of firms is essential for economic prosperity. There is a strong correlation between manufacturing GDP and a nation’s overall GDP. Why is manufacturing important? The cited benefits are: 1) Delivers prosperity to individuals and country; 2) Reduces unemployment; 3) Ensures national security; and 4) Promotes global competitiveness. Korean Innovation is when the Korean Creativity is Entrepreneured by Korean manufacturers. How do you think about Creative Economic Policy? It is important and critical to start with the Creative economy. Yet, this is half the formula. The other half is Entrepreneurship. The global Creative race is closing fast. Now the battle is who will entrepreneur the most. No individual or country can be creative. It takes a global team. This is why it is important to build friends and partners. Customers local and worldwide look at four key attributes for any product or service. They are Price, Convenience, Personalization, and Speed. I believe S. Korea can succeed in all four areas. Do you have any advice to Korea to lower youth unemployment? No one hires strangers. It seems youth are considered like strangers. SMEs in the United States economy (98%) are run like family enterprises. Like in any family, you want to meet young bright and ambitious youth. The U.S. has one of the best internship programs. Every year, U.S. companies welcome the youth to learn about their business, build new skills, and be young adults. The internship program is important as it prepares these companies to hire the youth (they met) and integrate them into their workforce as they graduate. Korea should celebrate their youth by encouraging all companies to offer internship programs. They are a capital treasure. They should not stay home. They should be interning in all companies and listening to advice, learning new skills, and making friends. It should be as important as going to the military. The youth are Korea’s future leaders!